What's the key to great tennis? 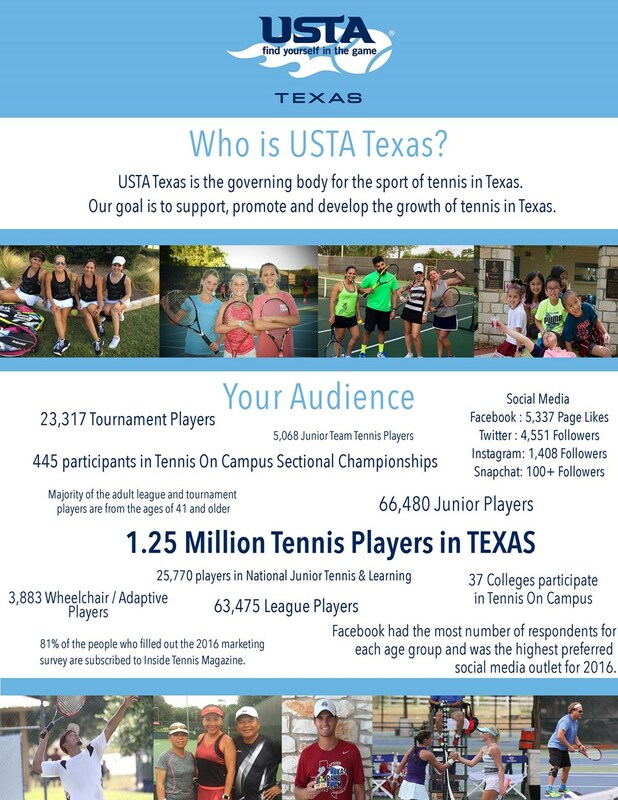 USTA Texas with over 50,000 members is proud to have dedicated partnerships that truly care about our great sport. Many of our partners offer exclusive incentives to members of the Texas Tennis family in addition to making significant contributions to our organization. Please support our partners as they work with us in promoting the growth and development of tennis in Texas. USTA Texas offer numerous opportunities for partners that are reflective of your needs. Packages can include specific programs and advertising in many of our printed and electronic publications. USTA Texas sponsorships provide the best value, including exposure and recognition on our website with direct links to your organization. Our annual USTA Texas Tournament Schedule Guide is a publication that is held by our membership for the entire year because of its monthly breakdown of tournament schedules for Seniors, Adults and Junior players. ADVERTISEMENT It also contains the Rules and Regulations and information about our 10 and Under Tennis programs. The section magazine, Inside Tennis / USTA Texas edition is published six times per year and has a reach of over 42,000 households with each issue. The publication is printed in all color with sponsorship opportunities as individual placements and as a part of a total sponsorship package. For more partnership details, to take advantage of the opportunity to reach the buying power of more than 50,000 affluent consumers, and to secure a package that best suits your needs, contact Taylor Heldfelt Jones, Senior Marketing Manager, USTA Texas at (512) 443-1334 ext. 219 or at tjones@texas.usta.com.